During gamete formation, crossover recombination must occur on replicated DNA to ensure proper chromosome segregation in the first meiotic division. We identified a Mec1/ATR- and Dbf4-dependent replication checkpoint in budding yeast that prevents the earliest stage of recombination, the programmed induction of DNA double-strand breaks (DSBs), when pre-meiotic DNA replication was delayed. The checkpoint acts through three complementary mechanisms: inhibition of Mer2 phosphorylation by Dbf4-dependent Cdc7 kinase, preclusion of chromosomal loading of Rec114 and Mre11, and lowered abundance of the Spo11 nuclease. Without this checkpoint, cells formed DSBs on partially replicated chromosomes. Importantly, such DSBs frequently failed to be repaired and impeded further DNA synthesis, leading to a rapid loss in cell viability. We conclude that a checkpoint-dependent constraint of DSB formation to duplicated DNA is critical not only for meiotic chromosome assortment, but also to protect genome integrity during gametogenesis. Most cells in an organism contain two sets of chromosomes, one inherited from the mother and the other from the father. However, sexual reproduction relies on the production of gametes—eggs and sperm—which contain only one set of chromosomes. These are produced through a specialized form of cell division called meiosis. Meiosis begins with a cell replicating its entire genome. Maternal and paternal versions of each chromosome then pair up and swap sections of their DNA through a process known as homologous recombination. This gives rise to chromosomes with new combinations of maternal and paternal genes. Finally, the cell undergoes two successive rounds of division—the first to produce a cell with two nuclei containing two sets of chromosomes each, and the second to produce four gametes, each containing a single set of chromosomes. Homologous recombination requires the formation of double-strand breaks in the DNA, but it is essential that these do not form before DNA replication is complete. Now, Blitzblau and Hochwagen have used yeast, which is easy to maintain in the lab and to manipulate genetically, to reveal the molecular components of a checkpoint that controls this process. Blitzblau and Hochwagen first used an inhibitor called hydroxyurea to block DNA replication in yeast cells, and confirmed that this treatment also suppressed the formation of double-strand breaks. By selectively inhibiting the activity of individual proteins, it was shown that break formation was controlled by a checkpoint that relies on two conserved proteins, the checkpoint kinase Mec1 (homologous to the human tumour suppressor ATR) and the cell-division kinase DDK. Moreover, when double-strand breaks were allowed to form on partially replicated chromosomes, DNA replication stalled and meiosis could not proceed normally, with lethal results for the yeast. These results explain how DNA replication and recombination are coordinated during meiosis in yeast. Moreover, because the genes that control meiosis are highly conserved from yeast to humans, they have implications for research into human fertility. During meiosis, a single round of DNA replication is followed by two nuclear divisions to produce haploid gametes from diploid progenitor cells. In most organisms, the faithful segregation of homologous chromosome pairs in meiosis I relies on physical connections between homologs produced by meiotic recombination. In budding yeast, DNA exchanges between homologs are the result of the repair of ∼160 DNA double-strand breaks (DSBs), which occur immediately following pre-meiotic S phase (meiS) and are distributed across all 16 chromosome pairs. DSB formation requires the concerted activity of 10 proteins, including the catalytic subunit Spo11 and its partner Ski8, the Mre11/Rad50/Xrs2 (MRX) complex, and the meiosis-specific proteins Mer2, Rec114, Mei4, Rec102 and Rec104 (reviewed in (Keeney and Neale, 2006)). Additionally, DSB formation requires the phosphorylation of Mer2 by two cell cycle kinases, cyclin dependent-kinase (CDK) and the Dbf4-dependent Cdc7 kinase (DDK) (Henderson et al., 2006; Sasanuma et al., 2008; Wan et al., 2008). The complexity of this process reflects the fact that meiotic genome fragmentation needs to be carefully controlled to limit genome instability. Under normal circumstances, meiotic DSBs are introduced after DNA replication. This temporal separation is necessary because the crossover-mediated linkages between homologs require sister-chromatid cohesion distal to the crossover site. Thus, only crossovers formed after DNA replication serve to hold homologous chromosomes together in metaphase I. Moreover, replication forks are unable to cross a DSB (Doksani et al., 2009), so the presence of >100 DSBs in the genome would severely interfere with the completion of DNA replication. The mechanisms that coordinate pre-meiotic DNA replication and DSB formation are not well understood. DNA replication and DSB formation are coordinated at the local level, because delayed replication of a single chromosome arm delays DSB formation on that arm (Borde et al., 2000). However, DSB formation does not require DNA replication; pre-meiotic replication initiation mutants introduce full levels of DSBs on chromosomes that are not replicated in both budding and fission yeasts (Murakami and Nurse, 2001; Hochwagen et al., 2005; Blitzblau et al., 2012). In addition, the initiation of meiotic recombination is prevented globally when DNA replication is delayed by nucleotide depletion (Schild and Byers, 1978; Tonami et al., 2005; Ogino and Masai, 2006). In fission yeast, a replication checkpoint blocks DSB formation in this situation (Tonami et al., 2005; Ogino and Masai, 2006). Although a related checkpoint was found to delay the meiotic divisions upon nucleotide depletion in budding yeast (Stuart and Wittenberg, 1998), a subsequent study came to the conclusion that it did not regulate DSB formation (Borde et al., 2000). Thus, it remains unclear how budding yeast prevent DSB formation on unreplicated DNA. The replication checkpoint couples DNA replication and cell cycle progression by sensing and coordinating the response to delayed replication forks (reviewed in (Labib and De Piccoli, 2011). In vegetatively growing yeast cells, stalled replication forks activate a conserved kinase cascade including Mec1/ATR and Rad53/CHK2. Mec1 and Rad53 inhibit cell cycle progression by preventing chromosome segregation and mitotic entry, respectively (Clarke et al., 2001; Clarke et al., 2003). Additionally, their activation stabilizes replication forks, preventing catastrophic fork collapse. Finally, activated Rad53 also phosphorylates and directly interacts with the Dbf4 subunit of DDK (Weinreich and Stillman, 1999; Duncker et al., 2002; Chen et al., 2013), which delays further initiation of DNA replication. The replication checkpoint has not been characterized in budding yeast meiosis. It presumably functions, because cells can respond to and recover from replication inhibition (Schild and Byers, 1978; Blitzblau et al., 2012) and meiotic functions of both Mec1 and Rad53 have been described (reviewed in (MacQueen and Hochwagen, 2011)). The fact that the replication checkpoint inhibits DDK activity in mitotic cells suggests that the checkpoint could be easily adapted to prevent meiotic DSBs by preventing the DDK-dependent phosphorylation of Mer2. To characterize the replication checkpoint during meiotic cell division, we investigated the effects of inhibiting pre-meiotic DNA replication. We found that the replication checkpoint is active in budding yeast meiosis and inhibits DSB formation. The checkpoint uses parallel mechanisms to regulate the abundance, DNA loading and DDK-dependent phosphorylation of DSB factors. Cells that formed DSBs on partially replicated chromosomes were unable to complete either DSB repair or genome duplication, revealing that the separation of DNA replication and meiotic DSB formation is critical for maintaining genome integrity and viability. To determine whether DSB formation is coordinated with bulk DNA replication during meiS in budding yeast, we exposed cells to increasing doses of the replication inhibitor hydroxyurea (HU) and measured the kinetics of DNA replication and DSB formation (using a rad50S mutation to prevent DSB repair). Because we previously observed significantly delayed meiotic entry when cells were treated with high concentrations of HU (Blitzblau et al., 2012), all of our analyses were carried out with 20 mM or lower amounts of HU. FACS analysis of total DNA content revealed that DNA replication occurred between 1–3 hr for wild-type cells in the absence of HU, was significantly delayed in 5 mM HU, and arrested in early S phase in 20 mM HU (Figure 1A). DSB formation was comparably affected when measured by Southern blot analysis of a prominent DSB hotspot on chromosome 3 (Figure 1B). Quantification of FACS profiles and Southern analysis revealed that DSBs appeared just after bulk DNA replication was completed (4C DNA content appeared) in 0 or 5 mM HU samples, and were fully suppressed when replication was blocked by 20 mM HU (Figure 1C). Consistent with the idea that slowing DNA replication activates the replication checkpoint, we detected HU-dependent Rad53 autophosphorylation by Western blotting (Figure 1D), which has been shown to be a direct effect of checkpoint activation in pre-mitotic cells (Pellicioli et al., 1999). In addition, we found that Mec1 and Rad53 were essential to maintain viability in HU-treated pre-meiotic cells (Figure 1—figure supplement 1A), indicating that activation of the pre-meiotic replication checkpoint is critical to maintain replication forks in the presence of replication inhibition, as in pre-mitotic cells. Ongoing DNA replication delays meiotic DSB formation. rad50S (H156, A–D) or cdc6-mn rad50S (H155, E–H) cells were induced to enter meiosis in 0, 5 or 20 mM HU and analyzed at the indicated time points. (A and E) FACS analysis of total DNA content. (B and F) Southern blot analysis of DSB formation at the yCR048W DSB hotspot. Arrows indicate the major DSB bands quantified in (C and G). (C and G) Quantification of 4C DNA content from FACS is shown in the upper panel. The measurement of DSBs from Southern blot is plotted in the lower panel. (D and H) Western blot analysis of Rad53 protein mobility is shown as a measurement of phosphorylation and activation. Slower migrating bands correspond to phosphorylated Rad53. See also Figure 1—figure supplement 1. We tested whether the DSB delay in HU-treated cells was due to inhibited DNA replication, as the mitotic replication checkpoint is characteristically activated by ssDNA at the replication fork. DNA replication is strongly decreased in cdc6-mn cells (Hochwagen et al., 2005; Blitzblau et al., 2012). This decrease was due to impaired replicative helicase loading (Figure 1—figure supplement 1B), and little DNA replication was observed in 0, 5 or 20 mM HU (Figure 1E). The cdc6-mn cells formed DSBs with wild-type kinetics in all concentrations of HU despite the absence of any completed DNA replication (Figure 1F,G), consistent with the idea that depleting the number of active replication forks abrogates the replication checkpoint signal. Importantly, we were unable to detect phosphorylation of Rad53 at 2–3 hr when DSBs formed (Figure 1H), indicating that the replication checkpoint is not efficiently activated in these cells. When cdc6-mn cells were exposed to concentrations of HU greater than 20 mM, DSB formation was either reduced or abolished without activation of Rad53 (data not shown), consistent with our previous report that high levels of HU can inhibit meiotic cell cycle entry (Blitzblau et al., 2012). This could explain why the checkpoint was previously not observed (Borde et al., 2000). Together, these data confirm that the canonical Mec1- and Rad53-dependent replication checkpoint responds to delayed DNA replication in budding yeast meiosis, and that DSB formation is delayed while DNA replication is ongoing. Given that Rad53 inhibits DDK in mitotically dividing cells and that DDK activates the meiotic DSB factor Mer2, we explored whether inhibition of pre-meiotic DNA replication delayed phosphorylation of Mer2. As shown in Figure 2A, when pre-meiotic cells were treated with HU, Dbf4 accumulated mainly in a hyperphosphorylated state. The amount of hyperphosphorylated Dbf4 was reduced in both mec1Δ and rad53Δ cells treated with HU (top panel), indicating that the massive accumulation of this form of the protein is checkpoint-dependent in meiotic cells as it is in mitotic cells (Weinreich and Stillman, 1999). For this analysis we used a polyclonal antibody to Dbf4, having noted that the C-terminally myc-tagged protein was unstable and present at much lower levels and with degradation products, compared to the untagged protein (data not shown). Consistent with the idea that the hyperphosphorylated form of Dbf4 is inactive in the cell, Mer2 accumulated in a hypophosphorylated form in HU-treated cells (Figure 2A, bottom panel) only when Mec1 and Rad53 were present. Because Mer2 is sequentially phosphorylated by both CDK and DDK prior to meiotic DSB formation (Sasanuma et al., 2008; Wan et al., 2008), we confirmed that Mer2 was phosphorylated by CDK in HU-treated cells (Figure 2—figure supplement 1A,B), indicating that HU treatment specifically inhibited DDK-dependent phosphorylation of Mer2. 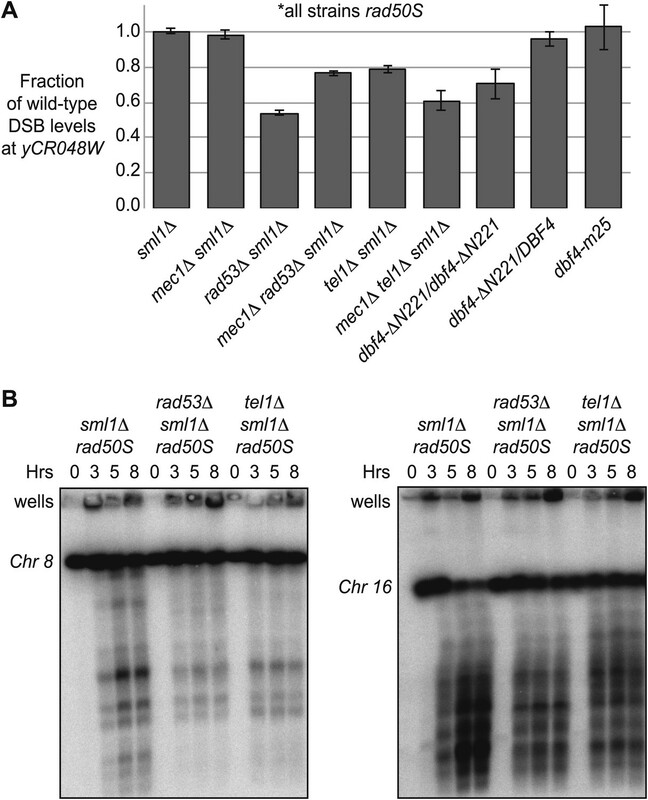 These results indicate that the replication checkpoint kinases Mec1 and Rad53 restrain DSB formation by limiting the activity of DDK, a role well established in the mitotic replication checkpoint. The pre-meiotic replication checkpoint inhibits DDK kinase activity. (A) Western blot analysis of Dbf4 (top panel) and Mer2-5myc (bottom panel) in sml1Δ (H5157), mec1Δ sml1Δ (H5220) and rad53Δ sml1Δ (H5127) cells. The sml1Δ mutation was used to maintain viability of mec1Δ and rad53Δ mutants. For Mer2-5myc blotting, only 20% (wild-type) or 50% (mec1Δ and rad53Δ) of total protein was loaded for HU-treated samples as high accumulation of the Mer2 protein obscured the analysis of mobility shifts. (B) Schematic of wild-type and mutant Dbf4 proteins analyzed in this study. N, M, and C refer to the N-terminal, middle and C-terminal conserved domains. (C) Southern blot analysis of DSB formation at the yCR048W DSB hotspot in rad50S cells for DBF4/DBF4 (H6097), dbf4-NLS-ΔN221/dbf4-NLS-ΔN221 (H6146) and dbf4-NLS-ΔN221/DBF4 (H7335) cells. (D) FACS analysis of total DNA content of the strains in (C). See also Figure 2—figure supplement 1. To test whether the activation of DDK is sufficient to allow for DSB formation in pre-meiotic cells, we sought an unregulated version of Dbf4 that could allow for DSB formation in HU-treated cells. We tested several previously characterized alleles of DBF4 in our Southern blot assay for DSBs (Figure 2B,C, Figure 2—figure supplement 1). 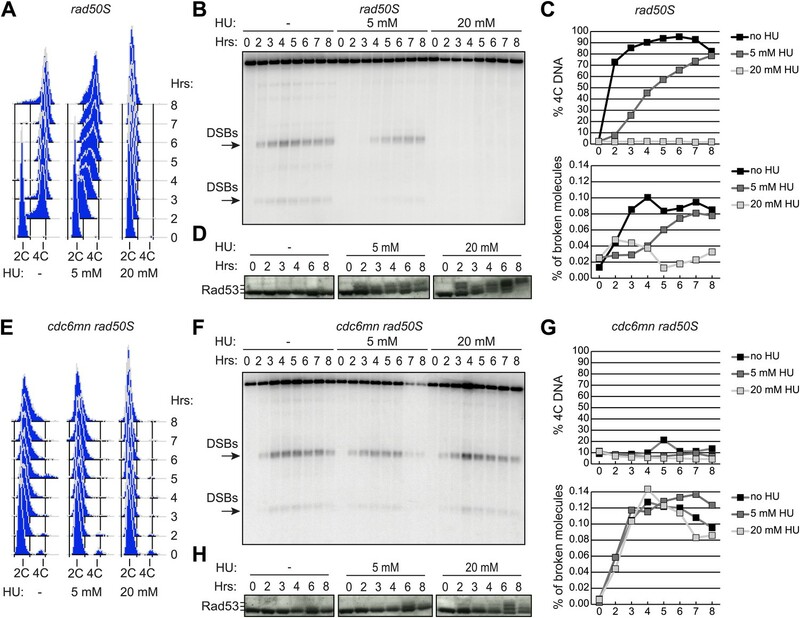 Cells expressing dbf4-NLSΔN221, an N-terminal truncation protein containing an SV40 nuclear localization signal (NLS) to support viability, formed high levels of DSBs in the presence of HU (Figure 2C) without a substantial increase in DNA replication (Figure 2D). The replication checkpoint bypass was dominant as DSBs also occurred in cells heterozygous for this dbf4 allele (Figure 2C). This result indicates that deregulating DDK activity is sufficient to allow the initiation of meiotic recombination in the presence of ongoing DNA replication. The dbf4-NLSΔN221 protein lacks the conserved N domain that has been shown to interact with Rad53 and other proteins (Gabrielse et al., 2006; Chen et al., 2013). However, cells harboring a smaller truncation of DBF4 that maintains the native NLS but removes the Rad53 interaction domain, dbf4-Δ71-221, bypassed the replication checkpoint poorly (Figure 2—figure supplement 1C), indicating that disrupting the Rad53 interaction alone is not sufficient to deregulate Dbf4 activity. Similarly, addition of the SV40 NLS to the wild-type Dbf4 protein did not allow for DSBs in HU-treated cells (Figure 2—figure supplement 1D), indicating the strong NLS was not solely responsible for the replication checkpoint bypass of the dbf4-NLSΔN221 allele. Thus, multiple functions of the Dbf4 N-terminus are likely required for the regulation of meiotic DSBs in response replication stress. We conclude that DDK regulation is critical in the pre-meiotic replication checkpoint. Given that Dbf4 is regulated by Rad53-dependent phosphorylation, we explored the role of such phosphorylation in preventing meiotic DSBs in response to HU-treatment. A dbf4 allele lacking 25 potential phosphorylation sites, dbf4-m25, allows the initiation of DNA replication from late origins in HU-treated pre-mitotic cells (Lopez-Mosqueda et al., 2010). However, this mutation did not permit DSB formation in pre-meiotic cells treated with HU (Figure 2—figure supplement 1E). This result indicates that simply preventing the Rad53-dependent phosphorylation of Dbf4 is insufficient to accumulate enough DDK activity to form meiotic DSBs in HU-treated cells. Furthermore, the dbf4-NLSΔN221 allele produced a truncated protein that shifted mobility consistent with phosphorylation in the presence of HU (Figure 2—figure supplement 1F), despite the fact that 21 of the 25 mutations in the dbf4-m25 allele are within the deleted region. These results suggest either the dbf4-NLSΔN221 mutant protein is unable to respond to Rad53-dependent phosphorylation, or that separate phosphorylation sites are required to prevent meiotic DSBs. We ruled out a function for the sole Mec1 consensus site on Dbf4, because mutation of threonine 163 to alanine did not allow DSB formation in HU (Figure 2—figure supplement 1G). Together, these data reveal that deregulating DDK is sufficient to allow DSBs in HU-treated cells. However, simply preventing the phosphorylation of Dbf4 or its interaction with Rad53 does not produce enough DDK activity to allow for DSB formation in HU-treated cells. Given that Dbf4 activity is critical for DSB formation, we tested whether removing the checkpoint kinases Mec1 and Rad53 that control Dbf4 activity was sufficient to allow DSB formation in HU-treated cells. We found that disruption of Mec1, either by deletion or using the mec1-1 allele (Figure 3A, Figure 3—figure supplement 1 and Figure 4—figure supplement 1), or removal of the Mec1-interacting protein Ddc2 (Figure 3—figure supplement 1A) was sufficient to allow DSB formation in HU-treated cells. DSB formation in mec1Δ cells occurred along entire chromosomes (Figure 3—figure supplement 1B) without significantly increased DNA replication (Figure 3B, Figure 3—figure supplement 1C), indicating the replication checkpoint was bypassed. The levels of DSB formation in mec1Δ cells treated with HU were lower than those observed in the absence of HU (Figure 3C), which we believe is due to relocalization of DSB factors in checkpoint mutants (discussed in more detail later). In contrast, rad53Δ cells failed to form DSBs in the presence of HU (Figure 3, Figure 3—figure supplement 1C). These results were confirmed in dmc1Δ repair-deficient strains, which arrest in meiotic prophase with resected DNA ends (Figure 3—figure supplement 1D), indicating they were not specific to the rad50S allele used in our initial assays. We eliminated the possibility that the pre-meiotic replication checkpoint utilizes alternate signaling kinases by simultaneously removing Mek1, Chk1 and Rad53, which did not allow DSB formation in HU-treated cells (Figure 3—figure supplement 1E). Similarly, neither removal of Rad53 kinase activity nor the deletion of the Rad53 activating proteins Rad9 and Mrc1 allowed DSBs to form in HU-treated cells (Figure 3—figure supplement 1F,G). 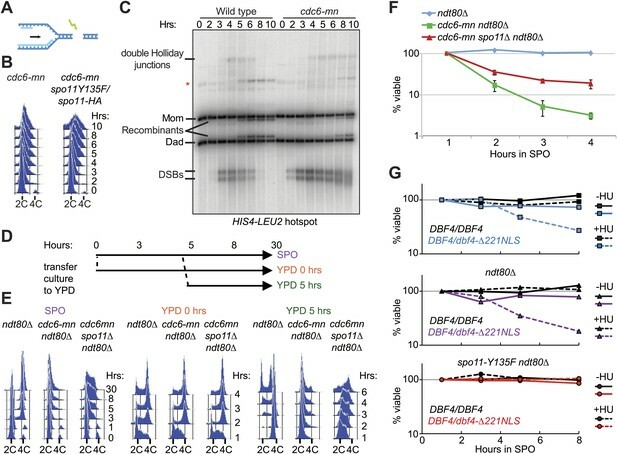 Indeed, removal of Mec1, but not Rad53, Rad53 kinase activity or Rad53-dependent phosphorylation sites on Dbf4, allowed DSB formation across entire chromosomes in both rad50S and dmc1Δ repair-deficient strains (Figure 3—figure supplement 1B,D). We noted that the lack of checkpoint bypass in the absence of Rad53 is in contrast to the bypass observed in Dbf4 truncation mutants (Figure 2). These findings argue against a strictly linear pathway, in which Mec1 acts through Rad53 to inhibit DDK, but rather suggest that there are Rad53-independent functions of the replication checkpoint in meiosis. Removal of MEC1, but not RAD53, allows DSB formation in HU-treated cells. (A) Southern blot analysis of DSB formation at the yCR048W DSB hotspot in sml1Δ rad50S (H4898), mec1Δ sml1Δ rad50S (H4935) and rad53Δ sml1Δ rad50S (H4969) and mec1Δ rad53Δ sml1Δ rad50S cells (H4932) in the absence or presence of HU. (B) FACS analysis of total DNA content of the strains in (A). (C) Quantification of the relative DSB levels from the Southern blot in (A) in the absence (solid lines) or presence (dashed lines) of HU. DSBs levels were measured as in Figure 1 and normalized to the maximum measurement in the sml1Δ rad50S (H4898) ‘wild-type’ strain (shown as grey lines for comparison). See also Figure 3—figure supplement 1. In the course of carrying out these experiments, we noticed that rad53Δ and rad53-kd cells exhibited lower DSB levels in untreated cells, specifically in the rad50S background (Figures 3 and 4A, Figure 3—figure supplement 1C,D), suggesting that Rad53 may play a second role in promoting meiotic DSBs in this context. A DSB-promoting role for Rad53 is also supported by our observation that deletion of RAD53 reduced the DSB levels of mec1Δ cells (Figure 3). In this case, DSBs were formed in HU-treated mec1Δ rad53Δ cells, but the break levels were substantially lower than in mec1Δ cells alone (Figures 3A,C and 4A), indicating Mec1 and Rad53 regulate DSBs using separate pathways. The rad50S mutation leads to the formation of blunt-ended DSBs that are detected by a Tel1 and Rad53-dependent checkpoint (Xu et al., 1997; Usui et al., 2001). We found that removal of Tel1 also lowered DSB levels in the absence of HU at the yCR048W hotspot (Figure 4A, Figure 4—figure supplement 1) and on whole chromosomes analyzed by pulsed-field gel analysis (Figure 4B), consistent with a recent report (Argunhan et al., 2013). Similar to the rad53Δ mutation, deletion of TEL1 also reduced DSBs in a mec1–1 background, while still allowing for replication checkpoint bypass in the presence of HU (Figure 4—figure supplement 1). Intriguingly, DSBs levels were also lowered in dbf4-NLSΔN221 cells (Figure 4A), but not dbf4-m25 mutants (Figure 2—figure supplement 1D), suggesting that Rad53 might promote DDK activity in a phosphorylation-independent manner. Thus, Tel1 and Rad53 are required to achieve maximal DSB levels in rad50S cells, whereas Mec1 inhibits DSBs in response to delayed replication using both Rad53-dependent and -independent mechanisms. These data extend recent findings that multiple checkpoint pathways modulate DSB formation in budding yeast (Zhang et al., 2011; Argunhan et al., 2013; Carballo et al., 2013; Gray et al., 2013). A Tel1-dependent feedback mechanism increases DSB levels in rad50S cells. (A) The maximum levels of DSBs in untreated rad50S strains containing the indicated mutations were measured from the Southern blots shown in Figure 2, Figure 3, Figure 2—figure supplement 1, Figure 3—figure supplement 1, and Figure 4—figure supplement 1. The amount of broken DNA was calculated as in Figure 1 and all values were normalized to the wild-type strain from the same experiment. (B) CHEF gel electrophoresis and Southern blotting was conducted to assess DSB levels on whole chromosomes in sml1Δ rad50S (H4898), rad53Δ sml1Δ rad50S (H4969), and tel1Δ sml1Δ rad50S (H4849) cells. Chromosomes 8 (left panel) and 16 (right panel) were resolved on separate gels, blotted and visualized with the following probes in SGD coordinates: Chromosome VIII: 23,771-25,410 and Chromosome XVI: 20,281-21,012. See also Figure 4—figure supplement 1. To address the mechanism of action of the pre-meiotic replication checkpoint, we analyzed DSB factor abundance and modifications in the absence or presence of HU, as DSB factor accumulation is limited by the checkpoint in Schizosaccharomyces pombe (Ogino and Masai, 2006). To ensure that the modifications we observed were the result of the replication checkpoint and not of DSBs themselves (which also activate Mec1), the analysis was carried out in spo11-Y135F ndt80Δ mutants that arrest in meiotic prophase without DSBs. The protein levels of most DSB factors were unchanged in the absence or presence of HU (Figure 5—figure supplement 1A), although we found that Mer2 accumulated to high levels in HU-treated cells (Figure 2A and legend, Figure 2—figure supplement 1A and Figure 5—figure supplement 1A). The exceptional protein in this analysis was Spo11, whose levels were approximately 10-fold lower in HU-treated cells than untreated cells (Figure 5A). This result was confirmed in wild-type cells (Figure 5—figure supplement 1B), indicating it was not the result of the spo11-Y135F allele. Spo11 levels were partially restored in mec1Δ and cdc6-mn mutants, but not rad53Δ cells (Figure 5A), indicating that downregulation of Spo11 protein is a result of Rad53-independent replication checkpoint activity. Northern blot analysis indicated that checkpoint-dependent downregulation of Spo11 occurs at the level of the SPO11 transcript (Figure 5B,C, Figure 5—figure supplement 1C). SPO11 RNA accumulation halted 1 hr after meiotic induction (the time of replication onset), ultimately leading to a reduction in steady-state RNA levels of at least 5-fold (Figure 5C, Figure 5—figure supplement 1C). We note that SPO11 RNA and protein were less abundant in rad53Δ cells than wild type, which may contribute the decreased DSBs levels in this strain background. We conclude that SPO11 expression is under checkpoint control. The replication checkpoint regulates DSB factor levels and DNA loading. (A–C) Analysis of spo11-Y135F-HA in sml1Δ ndt80Δ (H5233), cdc6-mn sml1Δ ndt80Δ (H7447), mec1-1 sml1Δ ndt80Δ (H5227), rad53Δ sml1Δ ndt80Δ (H5230) strains in the presence or absence of HU. (A) Western blot analysis of spo11-Y135F-HA levels. A twofold dilution series of the 5h (–HU) time point was used to estimate changes in protein levels in the presence of HU. The cross-reacting band marked with red asterisks serves as a loading control. (B) Northern blot analysis of spo11-Y135F-HA RNA. (C) Quantification of the Northern blots in (B). Northern blots were reprobed for UBC6 (Teste et al., 2009) for normalization. RNA levels of the spo11-Y135F-HA sml1Δ ndt80Δ ‘wild-type’ strain are shown as grey lines in all panels for comparison. (D) Binding profiles for Mer2-13myc (H4585) from genome-wide location analysis (ChIP-chip) along Chromosome 8 in the absence (blue lines) or presence (red lines) of HU. (E) As in (D), binding profiles from ChIP-chip analysis for Rec114-13myc (H4890) and Mre11-13myc (H5547) in wild-type cells in the absence (blue lines, Vader et al., 2011) or presence (red lines) of HU. (F) ChIP-chip binding profiles of and Rec114-13myc in mec1Δ sml1Δ (H7305) and rad53Δ sml1Δ (H7302) cells and for Mre11-13myc in mec1Δ sml1Δ (H7323) and rad53Δ sml1Δ (H7320) cells in the absence (blue lines) or presence (red lines) of HU. See also Figure 5—figure supplement 1. Our Western blot analysis also revealed that several DSB factors exhibited altered electrophoretic mobility upon HU treatment, indicative of a possible altered phosphorylation state. These changes are unlikely to be a consequence of direct phosphorylation by Mec1, as no protein showed the expected reduced mobility in HU-treated cells (Figure 5—figure supplement 1A). However, we noted that several protein bands showed faster mobility upon HU treatment, including Mer2, Rec104 (Figure 5B), Sae2/CtIP and Rec8 (Figure 5—figure supplement 1A). As Mer2 and Rec8 are both reported to be DDK targets, it is possible that the increased mobility of these proteins in the presence of HU is the result of the decreased DDK activity we observed. Sae2 shows checkpoint- and cell-cycle dependent phosphorylation (Huertas et al., 2008; Manfrini et al., 2010) and Rec104 has previously been described as a meiotic phospho-protein (Kee et al., 2004). These data raise the intriguing possibility that multiple DSB and repair factors are targets of DDK-dependent phosphorylation, including Rec104 and Sae2. To test whether the meiotic replication checkpoint affected the localization of DSB factors, we analyzed their DNA binding by genome-wide location analysis in the absence and presence of HU. Mer2-5myc was similarly detected on the same core meiotic chromosome binding sites occupied by axial proteins (Panizza et al., 2011) in the absence or presence of HU (Figure 5D), in spite of the fact that it is not fully phosphorylated in HU-treated cells (Figure 2A, Figure 5—figure supplement 1A). In contrast, we were unable to detect chromosomal loading of Rec114-13myc and Mre11-13myc in HU-treated cells, although both proteins associated with the DNA robustly in the absence of HU (Figure 5E). These data suggest that the loading of specific DSB factors is prevented by the replication checkpoint. To understand how the replication checkpoint prevents Rec114 and Mre11 DNA loading, we monitored their chromosomal association in mec1Δ and rad53Δ cells. We found that deletion of MEC1 restored Rec114-13myc loading in the presence of HU whereas deletion of RAD53 did not (Figure 5F, left panels), indicating that inhibition of Rec114 chromosome loading is Mec1-specific. Given that Rec114 forms a complex with Mer2 (Arora et al., 2004), it is possible that Rec114 DNA loading depends on Mer2 phosphorylation. However, we do not believe this to be case, as Mer2 was equally phosphorylated in both mec1Δ and rad53Δ cells (Figure 2A), yet Rec114 loading was specifically regulated by Mec1. Furthermore, Rec114-13myc could not be detected on chromosomes in HU-treated cells containing the mer2-DDD allele that mimics the DDK-dependent phosphorylations (Wan et al., 2008) (data not shown), consistent with the idea that Mer2 phosphorylation is not sufficient to recruit Rec114 to the DNA when Mec1 is activated. Similar to our results for Rec114, we found that chromosome loading of Mre11 was detectible in HU-treated mec1Δ, but not rad53Δ cells (Figure 5F, right panels). 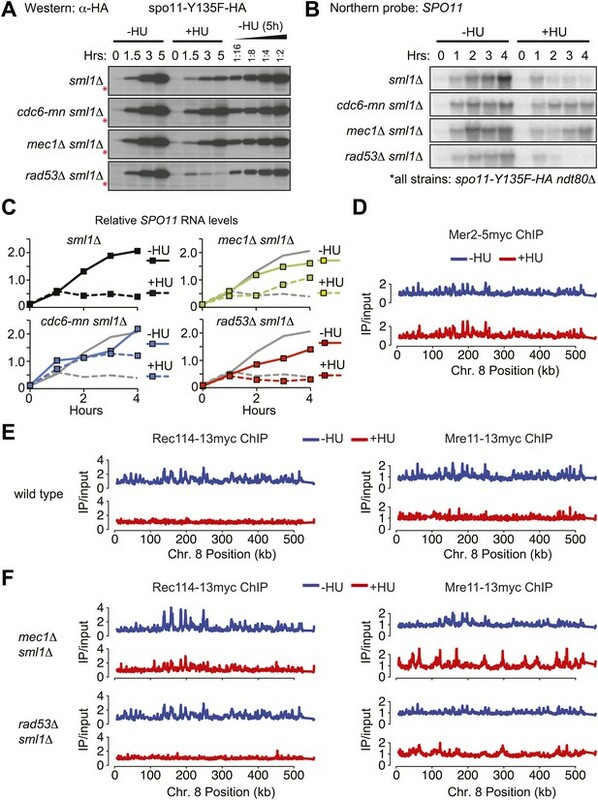 However, the pattern of Mre11 DNA-binding was altered dramatically in checkpoint mutant cells (mec1Δ and rad53Δ) treated with HU; Mre11 association with core meiotic chromosomal binding sites was substantially lower than in untreated cells, and the protein instead accumulated close to every pre-meiotic replication origin (Blitzblau et al., 2012) (Figure 5—figure supplement 1D, dashed grey lines). Indeed, Mre11 was significantly enriched specifically at replication origins in mec1Δ cells treated with HU (Figure 5—figure supplement 1E, p values from Student’s t test). We believe this to be the result of Mre11 recruitment to the aberrant DNA damage structures that form at replication forks when the replication checkpoint is impaired (Feng et al., 2006). This extensive relocalization of Mre11 may explain why DSB levels in mec1Δ cells are lower in the presence of HU than without treatment (Figure 3). The specific inhibition of Rec114 and Mre11 loading by Mec1 reveals an additional Rad53-independent replication checkpoint pathway. The presence of redundant mechanisms to inhibit meiotic DSB factors in response to DNA replication suggests that there are negative consequences of DSBs on replicating chromosomes. We were unable to test this hypothesis in the mec1Δ strain, as these cells die due to replication fork problems upon HU treatment (Figure 1—figure supplement 1A). Therefore, we employed the cdc6-mn strain, which experiences high levels of meiotic DSBs on chromosomes that have undergone very little replication (schematic Figure 6A). Although Cdc6 protein levels are strongly depleted in cdc6-mn mutants (data not shown), low levels of DNA replication were observed in this strain (Figure 6B, shoulder to the right of 2C DNA). To rule out the possibility that this was break-induced replication (BIR), we depleted DSBs in the cdc6-mn strain using a hypomorphic SPO11 allele. Remarkably, rather than observing a reduction in DNA replication, as would be expected if the shoulder in the FACS profile was due to BIR, we observed a substantial increase in DNA replication (Figure 6B). This suggests that DSBs in the cdc6-mn strain inhibit DNA replication, possibly by directly blocking replication forks and/or activating a DNA damage checkpoint. DSBs on replicating chromosomes are lethal. (A) Schematic of a DSB that occurs ahead of a DNA replication fork. (B) FACS analysis of total DNA content in cdc6-mn (H2655) and cdc6mn spo11-HA3-His6/spo11-Y135F (H3598) cells as they progress through meiosis. (C) Southern blot analysis of DSB formation and repair at the HIS4-LEU2 hotspot in wild-type (H2636) and cdc6-mn (H2655) cells. Cells were treated with psoralen and DNA was crosslinked with UV light to preserve recombination intermediates. The relative positions of parental bands, repair intermediates and recombinants are marked. The red asterisk marks the position of an alternative recombination product. (D) Schematic of the experiment shown in (E and F). Cells from ndt80Δ (H385), cdc6-mn ndt80Δ (H386) and cdc6-mn spo11Δ ndt80Δ (H3682) pre-sporulation cultures were split into YPD or SPO to induce mitosis or meiosis, respectively. After 5 hr, half of the SPO culture was returned to growth in YPD. (E) FACS analysis of total DNA content was performed for the experiment described in (D). (F) Viability of cells was measured for the strains described in (D) at the indicated time points during meiotic induction. The number of colonies at each time point was normalized to the 1-hr time point for each culture. (G) Viability of wild-type (H7099), dbf4-NLS-ΔN221/DBF4 (7401), ndt80Δ (H7494), dbf4-NLS-ΔN221/DBF4 ndt80Δ (H7493), ndt80Δ spo11-Y135F-HA (H7468) and dbf4-NLS-ΔN221/DBF4 ndt80Δ spo11-Y135F-HA (H7469) strains induced to enter meiosis in the presence or absence of HU and transferred onto YPD medium at the indicated time points. Each point is the average of two or three independent experiments. Viabilities were normalized to the 1-hr time point for each culture. See also Figure 6—figure supplement 1. We investigated the source of the DNA replication we observed in cdc6-mn cells. The DNA content increase was not due to mitochondrial DNA replication (Figure 6—figure supplement 1A), but rather because whole chromosomes were sporadically replicated and segregated in the cdc6-mn strain, as revealed by the occasional duplication and segregation of a single chromosome marked with a TetO array/TetR-GFP (Figure 6—figure supplement 1B). Although we were unable to detect the loading of Mcm2-7 helicase in cdc6-mn cells by genome-wide location analysis (Figure 1—figure supplement 1B), we believe that the SCC1 promoter driving CDC6 expression in the cdc6-mn strain allows for leaky expression that permits an undetectable amount of Cdc6 to act stochastically at replication origins throughout the genome. We suggest that the infrequency of these events precludes detection by population-based assays. Consistent with this idea, when we measured DNA replication in the cdc6-mn cells after 8 hr in sporulation medium compared to G1 unreplicated DNA, no specific chromosomes or regions of the genome were preferentially replicated except the ribosomal DNA (rDNA) (Figure 6—figure supplement 1C). Because the rDNA contains ∼100 tandem 9.1 kb repeats, each with its own potential origin of replication, the chance that one of these repeats would load Mcm2-7 and initiate DNA replication is extremely high, compared to the 11–46 origins present in the single-copy regions of each chromosome. Therefore, we conclude that cdc6-mn cells undergo sporadic chromosomal replication initiation, although clearly the levels of replication are too low to promote a checkpoint response in the critical period, during which DSBs must be prevented (Figure 1H). To understand the consequences of forming DSBs on replicating chromosomes, we analyzed DSB repair in cdc6-mn cells at the well-characterized HIS4-LEU2 locus on chromosome 3 (Hunter and Kleckner, 2001). Engineered restriction sites at this locus permit the measurement of DSB repair by Southern blot analysis. In wild-type cells, DSB formation is followed by the accumulation of double-Holliday junction repair intermediates. These intermediates are subsequently resolved into crossover products that show an altered molecular weight from the parental fragments (Figure 6C). DSBs formed at wild-type levels at HIS4-LEU2 in cdc6-mn cells, and a subset of DSBs were converted into crossovers, indicating that cdc6-mn cells are able to undergo homologous recombination. However, we also observed many DSBs that accumulated and migrated faster in the gel at 8–10 hr, indicating that repair of these breaks is defective and they become hyperresected (Figure 6C). Similarly, cdc6-mn cells exhibited a small defect in synaptonemal complex formation between homologous chromosomes (Figure 6—figure supplement 1D,E), likely a result of the repair defects we observed. Thus, a subset of DSBs persist in cdc6-mn mutants, indicating that cells that form DSBs on partially replicated chromosomes are unable to complete DSB repair. Given that cdc6-mn cells have problems completing both DNA replication and DSB repair, we asked whether these defects affected later meiotic events or cell viability. Spindle and DAPI analysis revealed that despite ongoing DNA replication and unrepaired DSBs, cdc6-mn cells entered into the meiotic divisions with little delay from the wild-type cells (Hochwagen et al., 2005), but exhibited strongly reduced levels of tetranucleate formation (Figure 6—figure supplement 1C) and no viable spores were produced (data not shown). This result suggests that DSBs formed during meiS are catastrophic for meiotic cells, which are unable to complete DNA replication or restrain the nuclear divisions. We employed the return-to-growth protocol to determine the contribution of precocious DSB formation to cell lethality. DSB repair in meiotic cells is constrained to promote homologous recombination. Some DSBs, for example in dmc1Δ cells, cannot be repaired during meiosis, but can be repaired if cells are returned to mitotic growth in rich medium (Shinohara et al., 1997; Zenvirth et al., 1997). 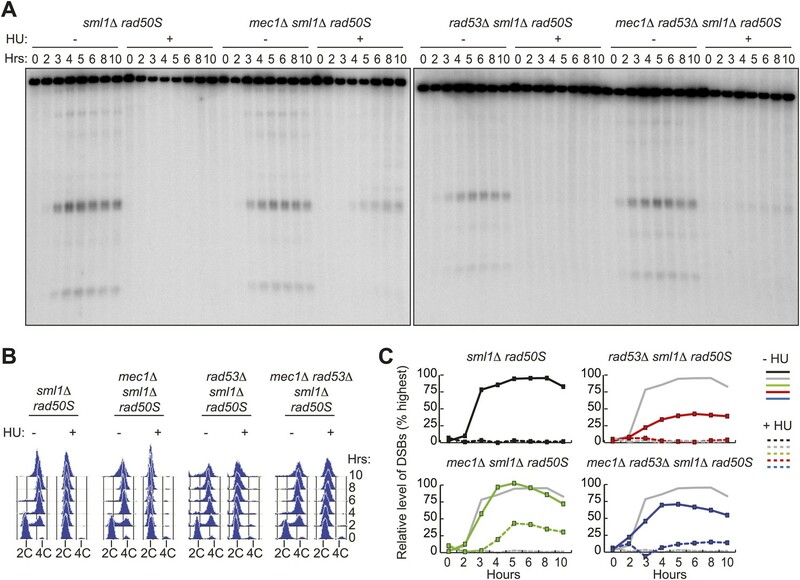 We analyzed ndt80Δ, cdc6-mn ndt80Δ and cdc6-mn spo11Δ ndt80Δ strains that were blocked in meiotic prophase to prevent meiotic chromosome segregation (experimental outline in Figure 6D), and measured DNA replication (Figure 6E) and viability (Figure 6F). Cells returned to rich medium prior to meiotic entry (0 hr), should express CDC6 normally from the SCC1 promoter, and, accordingly, we observed no defect in DNA replication or cell division (Figure 6E, middle three panels). When cells remained in sporulation medium, little DNA replication occurred in cdc6-mn ndt80Δ cells, but much more was observed in cdc6-mn spo11Δ ndt80Δ cells by 30 hr (Figure 6E, left three panels), showing that DSBs substantially impeded the completion of DNA replication in the cdc6-mn background. When cells were returned to growth in rich medium after 5 hr in sporulation medium, wild-type cells had already completed DNA replication (Figure 6E, first right panel), and returned to cycling with 100% viability (Figure 6F). In contrast, cdc6-mn cells were able to complete very little DNA replication upon return to growth (Figure 6E, second to last panel) and lost viability quickly after exposure to sporulation medium (Figure 6F). Removal of Spo11 allowed more DNA replication upon return to growth (Figure 6E, compare last two panels) and the spo11Δ strain exhibited significantly increased viability over the SPO11 strain. We confirmed that replication-checkpoint bypass similarly results in HU- and Spo11-dependent lethality in the dbf4-NLSΔN221 strain background in unblocked meiosis (top panel), as well as in prophase-arrested cells (ndt80Δ) (Figure 6G). Together, these results reveal that preventing DSB formation on replicating chromosomes is essential to inhibit a lethal meiotic chromosome fragmentation event that significantly impedes both the completion of DNA replication, and the repair of meiotic DSBs. The data presented here demonstrate that the replication checkpoint functions during budding yeast meiosis to maintain genome stability and viability. The checkpoint employs multiple strategies to inhibit DSB factors while DNA replication is ongoing. Without this restraining mechanism, cells form high levels of DSBs on partially replicated chromosomes, and lose the ability to complete either DNA replication or DSB repair. In this study we have defined the core components of a pre-meiotic replication checkpoint in budding yeast. Meiotic cells detect replication stress using the canonical replication checkpoint machinery, which then regulates meiosis-specific processes. As during mitotic S phase, detection of HU-induced replication inhibition relies on Mec1 and Ddc2. Mec1 activates the Rad53 effector kinase, which, in turn, inhibits DDK activity. The essential roles of Mec1 and Rad53 in maintaining replication fork stability appear to be equally important in meiotic cells, as removing either protein is lethal when cells are exposed to HU in meiS. Similar to the mitotic replication checkpoint, redundant and separable Mec1- and Rad53-dependent mechanisms maintain genome stability and prevent precocious cell-cycle progression in the presence of replication inhibition during meiosis (Labib and De Piccoli, 2011). However, the targets of the checkpoint differ. We found that the pre-meiotic replication checkpoint prevents accumulation, DNA-loading and phosphorylation of DSB factors (Figure 7, model). First, Mec1 downregulates SPO11 transcript levels. Although Spo11 production is not completely prevented, we believe that downregulation of Spo11 has functional consequences because genetically decreasing Spo11 activity was able to significantly rescue DNA replication in the cdc6-mn strain (Figure 6B). Second, Mec1 activity strongly reduces the DNA loading of Rec114 and Mre11. Rec114 is phosphorylated in a Mec1-dependent manner in response to meiotic DSBs (Carballo et al., 2013). However, such phosphorylation was found to increase Rec114 chromosomal association and we found no evidence that Rec114 or Mre11 are direct targets of Mec1 during meiS. The lack of DSB factor loading could be due to impaired axis formation, in spite of the fact that Rec8, Hop1 and Red1 load robustly onto the DNA in HU-treated cells (Blitzblau et al., 2012). Alternatively, the DSB factors may be directly regulated by the replication checkpoint. Third, Rad53-dependent inhibition of DDK prevents Mer2 phosphorylation, which is expected to block meiotic DSBs (Sasanuma et al., 2008; Wan et al., 2008). The redundancy resulting from the separable inhibition of all of the major DSB complexes likely increases the speed and robustness of the checkpoint response, which is important given the severe repair defects and lethality associated with precocious DSB formation on unreplicated DNA. Model for the pre-meiotic replication checkpoint in budding yeast. A schematic for the assembly of the four budding yeast DSB factor complexes (as defined below) in the absence (left) and presence (right) of replication inhibition is shown. In the absence of inhibition, all factors load onto the DNA and Mer2 and Rec104 are fully phosphorylated, allowing Spo11 to introduce DSBs. In the presence of HU, the levels of SPO11 transcripts are reduced, the DNA loading of Mre11 and Rec114 is prevented and the phosphorylation of Mer2 and Rec104 is abrogated. Illustration by Tom DiCesare (Whitehead Institute). The role of Dbf4 in the replication checkpoint remains elusive. Studies in pre-mitotic cells indicate that DDK activity is regulated by Rad53-dependent phosphorylation and interaction (Zegerman and Diffley, 2010; Chen et al., 2013), but our results separate the phosphorylation status and activity of the protein from the ability to form DSBs in HU-treated cells. HU treatment resulted in Mec1- and Rad53-dependent Dbf4 phosphorylation and a block of DDK target phosphorylation. 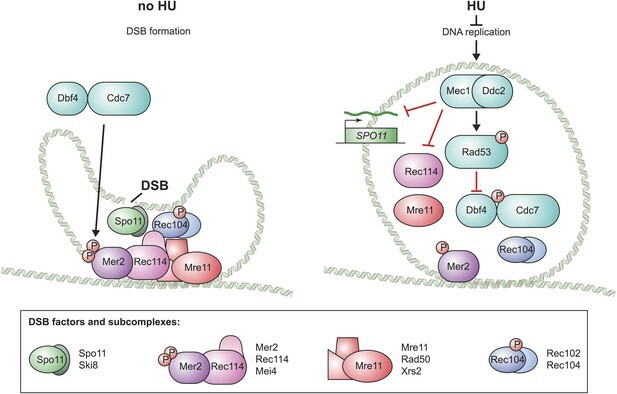 However, neither removal of Rad53 (which prevented Dbf4 hyperphosphorylation and allowed for Mer2 phosphorylation) nor the dbf4-m25 non-phosphorylatable protein allowed DSBs in the presence of HU, indicating that simply allowing DDK activation does not bypass the pre-meiotic replication checkpoint. Furthermore, the dbf4-Δ71-221 protein that cannot interact with Rad53 (Chen et al., 2013) also did not allow for checkpoint bypass. The only form of Dbf4 that allowed for efficient DSB formation in HU-treated cells was dbf4-NLSΔN221, which appears to be an unregulated version of the protein that is dominant to the wild-type. The fact that the dbf4-NLSΔN221 strain is not sensitive to HU in mitotic cells (Gabrielse et al., 2006) suggests that this allele does not bypass checkpoint activation, but rather acts downstream or in parallel to Mec1 and Rad53. It is possible that dbf4-NLSΔN221 is hyperactive compared to the wild-type protein and overcomes the checkpoint, or that it accumulates DDK activity early and ‘licenses’ DSBs before the replication checkpoint is activated. Regardless of the mechanism, our results clearly indicate that controlling DDK activity is a critical step in regulating DSB formation. It is intriguing that there is so little Rad53-dependent checkpoint activation in cdc6-mn cells, in spite of the observation that they can initiate significant DNA replication, as evidenced in spo11 mutant cells. One possibility is that DSB formation in cdc6-mn cells triggers the activation of the recombination checkpoint, in which Mec1 specifically activates the Mek1 kinase and not Rad53 (Usui et al., 2001; Cartagena-Lirola et al., 2008) to direct DSB repair activity to the homologous chromosomes (Carballo et al., 2008; Niu et al., 2009). Therefore, Rad53 activity may be specifically suppressed during prophase by the DSBs in cdc6-mn cells. Rad53 can be activated later in meiosis (Cartagena-Lirola et al., 2008), and consistently, we noted that Rad53 became activated at later time points in cdc6-mn cells treated with HU (Figure 1H), which proceed into the meiotic divisions with replication forks and DSBs. An alternative and non-exclusive model is that no replication checkpoint is activated in cdc6-mn cells either because Cdc6 itself is a checkpoint factor, as has been suggested for S. pombe (Hermand and Nurse, 2007), or the number of replication forks is too low to promote checkpoint activation. In either case, the observed restriction of Rad53 activity could allow cells to treat DNA lesions differently depending on the type of damage and phase of the cell cycle. The pre-meiotic replication checkpoint delays DSB formation and cell cycle progression during impaired DNA replication, but it is not the only mechanism to preserve cell cycle order. Measuring the kinetics of DNA replication and DSB formation in both unchallenged and HU-treated cells indicated that DSB formation occurs with a fixed delay with respect to the appearance of 4C (replicated) DNA, consistent with previous observations (Padmore et al., 1991). Therefore, it appears that under normal circumstances, DSBs occur only after bulk DNA replication. Furthermore, DSB formation seems to be timed independently from DNA replication, as it did not occur significantly earlier in cdc6-mn replication-depleted or checkpoint mutants cells, suggesting the order and timing of the two processes are under independent cell cycle controls. A second mechanism to directly couple DNA replication and DSB formation has been described; delaying DNA replication on the left arm of chromosome 3 similarly delays local DSB formation (Borde et al., 2000). However, we do not believe this coordination is the same as the checkpoint described here, as delaying DNA replication with low concentrations of HU was sufficient to block DSB formation until 4C DNA appeared, that is when meiS was completed. The local delay of DSB formation with late forks is likely necessary, because we have shown here that the replication checkpoint is insensitive to very low levels of DNA replication, such as in the cdc6-mn mutant. Therefore, any genomic regions with late forks that do not complete replication inside of the normal S phase would be subject to this second coupling mechanism to ensure DSBs do not occur prior to replication completion. The severe phenotype exhibited by cells that make breaks on replicating chromosomes could explain the existence of multiple coordinating mechanisms for meiS and DSB formation. A pre-meiotic replication checkpoint that prevents DSBs in response to replication inhibition is conserved in the distantly related fission yeast S. pombe, where Rad3/ATR/Mec1 and Cds1/CHK2/Rad53 are similarly activated in response to HU treatment. Some mechanistic differences exist, which could be due to the lack of identity of the DSB factors themselves. First, unlike budding yeast, fission yeast lacking the Rad53 homolog Cds1 form DSBs in the presence of HU (Tonami et al., 2005; Ogino and Masai, 2006). Second, although specific DSB factors are transcriptionally downregulated in S. pombe (Ogino and Masai, 2006; Miyoshi et al., 2012), their identity is not conserved in budding yeast and the S. pombe Spo11-homolog Rec12 was not affected. Other mechanistic parallels remain to be tested, in particular, the role of DDK in the pre-meiotic replication checkpoint, which we identified as a central player in coupling DNA replication with DSB formation in budding yeast. The S. pombe Cdc7 homolog Hsk1 is essential for DSB formation (Ogino et al., 2006), and is regulated by the pre-mitotic replication checkpoint (Snaith et al., 2000). The close temporal succession of pre-meiotic DNA replication and DSB formation is a universal feature of meiotic recombination, and our data demonstrate that the separation of these two processes is vital for maintaining genomic integrity. Given that both the DDK cell cycle kinase and the replication checkpoint are highly conserved in all eukaryotes, it seems likely that similar coupling mechanisms exist to protect the gametes in other species, including humans. Strains used in this study are isogenic to SK1 and are listed in Supplementary file 1. Gene disruptions and tagging were carried out using a PCR-based protocol (Longtine et al., 1998). Synchronous meiosis was induced as previously described (Blitzblau et al., 2012). For HU experiments, cells were inoculated into sporulation medium (SPO) containing 20 mM HU at 30°C, except in Figure 1 when 5 mM HU was used as indicated. The proportion of viable cells in the culture was measured at each indicated time point by removing and plating ∼500 cells on YPD plates and measuring the number of colonies that grew after 3 days at 30°C. The number of colonies present was normalized to the number observed at the first time point (0 or 1 hr after introduction into SPO). FACS analysis for total DNA content was performed as in (Blitzblau et al., 2012). Clamped-homogeneous electric field (CHEF) gel electrophoresis and Southern blotting for small chromosomes (including chromosome 8) were performed as described (Blitzblau et al., 2007). Large chromosome CHEF analysis was carried out similarly, using a 1% gel for 15 hr with 60 s pulses followed by 9 hr at 90 s. For resolution of recombination intermediates, cells were killed with 0.1% sodium azide. They were resuspended in 0.1 mg/ml psoralen in TE (50 mM Tris pH 7.5, 50 mM EDTA) and crosslinked with 365-nm UV light for 12 min on a UV lightbox (5 mW/cm2) in a polystyrene culture dish. DNA was isolated via standard Southern protocol. All time course experiments for Southern analysis were repeated at least twice with similar results. Whole cell protein extracts were prepared by TCA precipitation as in Blitzblau et al. (2012). An equal number of cells were loaded for each sample and equivalent loading was confirmed by Ponceau S staining. SDS-polyacrylamide gel electrophoresis and blotting were performed as described in Falk et al. (2010). The following antibodies were used for detections, all diluted in PBS-T + 3% milk (TBS-T was used for Mer2 phospho-S30) and incubated overnight; anti-Rad53 yC-19 (Santa Cruz Biotechnology Inc, Santa Cruz, CA) used at 1:5,000 dilution and Rad53 separated on an 8% gel; rabbit polyclonal anti-Dbf4 HM5765 (Steven P Bell, Francis, et al., 2009) was used at 1:1,000 dilution and Dbf4 separated on a 7.5% gel; anti-myc 9E10 (Covance, Princeton, NJ) was used at 1:1,000 for the following proteins: Mer2, Rec104, and Sae2 separated on 14% gels, Rec114, Mei4, and Rec102 separated on 12% gels, Spo11, Mre11, Xrs2, and Ski8 separated on 10% gels; anti-HA 12CA5 (Roche, Basel, Switzerland) was used at a 1:1,000 dilution for Rad50 separated on a 7.5% gel and Rec8 separated on a 10% gel; anti-HA 3F10 (Roche) was used at 1:1,000 for spo11-Y135F-HA separated on a 12.5% gel; anti-Mer2 phospho-S30 (Abcam, Cambridge, MA) was used at a 1:1,000 dilution. The appropriate species secondary antibodies were diluted 1:5,000 in PBS-T + 3% milk (except TBS-T was used for Mer2 phospho-S30) and incubated for 2 hr at room temperature. Northern blot analysis was performed as in Hochwagen et al. (2005) with minor modifications. 6 ml of cells were harvested at the indicated time points, washed once with 1 × TE (10 mM Tris pH 7.5, 1 mM EDTA) and frozen at −80°C. Cell pellets were ruptured by vigorous shaking for 30 min at 4°C in equal volumes glass beads, phenol-chloroform-isoamylalcohol (25:24:1) and cold RNA buffer 1 (300 mM NaCl, 10 mM Tris pH 7.5, 1 mM EDTA, 0.2% SDS). RNA was precipitated in ethanol and resuspended at 65°C in RNA buffer 2 (10 mM Tris pH 7.5, 1 mM EDTA, 0.2% SDS). 30 μg of each RNA sample were denatured at 65°C in denaturing solution (50% formamide, 6.5% formaldehyde, 40 mM MOPS pH 7.0, 10 mM sodium acetate, 0.1 mM EDTA) and separated by electrophoresis in a 1.1% agarose gel (containing 6% formaldehyde) in MOPS buffer (40 mM MOPS pH 7.0, 10 mM sodium acetate, 0.1 mM EDTA). RNA was blotted onto a Zeta probe GT membrane (BioRad) in 10 × SSC (1.5 M NaCl, 150 mM sodium citrate, pH 7.0) and UV-crosslinked using a Stratalinker. Probe hybridization was performed as for Southern blots. 25 ml of cells were harvested after 3 hr in SPO. Chromatin immunoprecipitation (ChIP) for genome-wide location analysis was performed as described (Blitzblau et al., 2012). One tenth of the lysate was removed as an input sample. Samples were immunoprecipitated for 16 hr at 4°C with anti-HA 3F10 (Rec8-3HA, Roche, used 2 µg per immunoprecipitation), ChIP grade anti-myc 9E11 (Abcam, 2 µl used per immunoprecipitation) or UM185 (Rabbit polyclonal anti-Mcm2-7, Stephen P Bell, 2 µl serum used per immunoprecipitation). Total genomic DNA extraction for CGH analysis was performed as described in Blitzblau et al. (2012). For ChIP experiments, one half of the immunoprecipitated DNA and one tenth of the input DNA were labeled. Samples were labeled and hybridized as in Blitzblau et al. (2012). For each co-hybridization, Cy3 and Cy5 levels were calculated using Agilent Feature Extractor CGH software. Background normalization, log2 ratios for each experiment and scale normalizations across each set of biological replicates were calculated using the sma package (Yang et al., 2001) in R, a computer language and environment for statistical computing (v2.1.0, http://www.r-project.org). The value of the feature closest to each potential pre-meiotic replication origin (Blitzblau et al., 2012) was used to estimate Mre11 binding close to replication origins. The raw data and log ratios analyzed in this study are available from the NCBI Gene Expression Omnibus (http://www.ncbi.nlm.nih.gov/geo/), accession number GSE46841. Meiotic nuclear spreads were performed as described (Falk et al., 2010). In brief, the nuclei of spheroplasted cells were spread on a glass slide in the presence of paraformaldehyde fixative and 1% lipsol. After drying, the slides were blocked in blocking buffer (0.2% gelatin, 0.5% BSA in PBS) and stained with anti-Rad51 y-180 (Santa Cruz) used at 1:200 dilution and anti-Zip1 yN-16 (Santa Cruz) used at 1:100 dilution. Proc Natl Acad Sci USA 25:16087–16092. Philos Trans R Soc Lond B Biol Sci 1584:3554–3561. Proc Natl Acad Sci USA 21:8131–8136. Proc Natl Acad Sci USA 16:5797–5801. Microarrays: Optical Technologies and Informatics, San Jose:, SPIE, Society for Optical Engineering. Thank you for sending your work entitled “ATR/Mec1 prevents lethal meiotic recombination initiation on partially replicated chromosomes in budding yeast” for consideration at eLife. Your article has been evaluated by a Senior editor and 4 reviewers, one of whom is a member of our Board of Reviewing Editors. Although there was some disagreement among reviewers over the novelty of the findings, on balance they came to the conclusion that if you can address the comments enumerated below, the paper will represent a valuable contribution to the field that merits publication in eLife. If you are not able to address the key comments, we do not advise resubmission. 1) “We do not know the cause of this repair defect, but one possibility is that allelic DSBs accumulate that have no unbroken sister-chromatid template from which to be repaired. Whatever the cause, cells that form DSBs on partially replicated chromosomes are unable to complete DSB repair.” All sorts of defects could be occurring in these cells, e.g., defective cohesin function (known to cause HR defects). Maybe DSBs continue to be made – indeed, DSB levels in Figure 1 are 40% higher in cdc6-mn cells. So, additional deregulation is occurring. Moreover, unlike most mutants with DSB repair defects, checkpoint arrest is not robust in these cells. In addition, with respect to viability loss, surely partially replicated chromosomes are a much bigger problem than unrepaired DSBs? The differences in the amount of replication between cdc6-mn and cdc6-mn spo11 mutants make it impossible to tease out the relative contributions of DSBs and partial replication to cell death. Therefore, it seems that the specific contribution of DSBs made on partially replicated chromosomes to cell death in cdc6-mn cells is completely unclear. 2) Figure 6; interhomolog double Holliday structures are detected in cdc6-mn cells, so strand exchange can clearly occur. Also, crossover products form at appreciable levels – please show quantification. Does this mean that non-crossover recombination is more defective? Maybe a sister chromatid is important for non-crossover formation? We also wondered whether Holliday structures between sister chromatids are detected in cdc6-mn. This is a good control to confirm the replication block in this mutant. 3) There is a lack of quantification throughout the paper, both for Southern and Western analysis. None of the figures have error bars and there's no indication that any of the experiments were done more than once. The authors need to explain how they ensure the reproducibility of their observations. 4) Figure 2A; the authors claim that Dbf4 is not hyperphosphorylated in mec1 strains but this is not clear from the gel that is shown. There is definitely a shift compared to no HU or even rad53 with HU. 5) Figure 5A: the authors claim that the decreased levels of Spo11 observed in the presence of HU are restored in mec1 and cdc6-mn mutants but this is not apparent in the gel that is shown. Quantitation and some loading controls would clarify this issue. 6) The relevance of reduced Spo11 levels with respect to inhibition of DSBs is unclear and claims otherwise should be toned down. DSBs form in wild type cells when Spo11 levels are relatively low so it's not clear that effects detected here are relevant. The authors should look at Spo11 transcript levels (given that S. pombe Rec12 transcription was not altered in S. pombe). 7) We are also quite suspicious of the rad53-independent effect of mec1 for the following reason. Rad53 mutants are sicker than mec1 mutants. This is likely because Rad53 still has a bit of activity from Tel1 activation. If the authors are seeing a non-specific loss of DSBs due to the effect of a loss of all Rad53 activity (in the 53 delete or the mec1tel1 double), then it is impossible to tell whether the rescue that they see in the mec1 delete is rad53-dependent. Some Rad53 functions are preserved in a mec1Δ and others are not. 9) There are a lot of molecular details in the summary figure that are never tested in the manuscript. In fact, the only data that are clear are the ones that are previously known (Dbf4 is a Rad53 substrate and Mer2 is a Cdc7/Dbf4 substrate). The authors should examine the phosphorylation of Rec104 in cdc7ts, mec1Δ, rad53Δ, mek1Δ, and the non-phosphorylated dbf4 alleles. A) The authors cite Figure 2C regarding the dbf4 heterozygous allele. However there are no data showing this. B) Citation of Figure 2–figure supplement 1B regarding dbf4-Δ71-221 bypassing the replication checkpoint shows Southern data. This needs to be FACS data, as we’re not sure how the data presented addresses this. 11) The phospho-S30 Mer2 data in Figure 2–figure supplement 1A mirrors the total, and therefore it isn't clear if this is just nonspecific. Can the authors use a cdk mutant to control this? A phosphosite mutant is not as good, since nonspecific phosphoantibodies still often recognize the exact phosphosite in the unphosphorylated state (but not a mutant site). 12) Unless the authors can override, with specific manipulations (specific mutations etc), the various inhibitory branches of the checkpoint, they cannot formally state that any of them are important to inhibit DSB formation. Therefore, they should be more cautious in their claims about the targets of the checkpoint. 13) Figure 6–figure supplement 1E; the data are not very convincing. The SC is presumably abnormal in cdc6-mn strain, so how is full SC measured? 14) What is the role of late origin firing for the increased DSB levels seen in WT + HU versus mec1 + HU scenarios? It would be useful to see a FACS profile for mec1 + HU. The reviewers raise an important point: the viability loss of cdc6-mn mutants is likely a compound effect of the fact that these mutants have a severe underlying defect in origin firing and the fact that they form DSBs on unreplicated chromosomes. To address this point, we now included viability analysis of dbf4-ΔN221/DBF4 cells. The dbf4-ΔN221 mutation confers a dominant checkpoint bypass (Figure 2C). Thus, use of a heterozygous dbf4-ΔN221/DBF4 strain allowed us to separate the checkpoint function of DBF4from its replication function (as well as other meiotic functions, which appear unaffected in the dbf4-ΔN221/DBF4 strain). As shown in the revised Figure 6, dbf4-ΔN221/DBF4 cells exhibit a loss of viability specifically in HU. This loss of viability was entirely dependent on DSB formation, indicating that these mutants form DSBs in HU that are not properly repaired. We therefore concluded that inappropriate DSB formation on replicating chromosomes contributes to the loss of cell viability in checkpoint mutants. We certainly agree with the reviewers’ point that “all sorts of defects could be occurring” in the cdc6-mn mutants with regards to DSB repair and we aimed to convey this in our original statement. The reason we highlighted allelic breaks is that these would be an obvious problem that would uniquely affect unreplicated chromosomes and could explain why some DSBs (at the same locus) were efficiently repaired and others were not. However, we understand that there are many other possible reasons for the repair defect in cdc6-mn cells. Thus, we have removed the discussion of speculatory models from this section. To address the specific possibilities suggested by the reviewers: we do not favor the hypothesis of defective cohesin function, as we have shown previously that cdc6-mn cells load Rec8, build axes and form DSBs comparably to wild type cells. By contrast, loss of cohesin causes a very specific loss of axis structure and decreased DSB formation. We also do not have evidence that cdc6-mn cells continue to form more DSBs than wild type cells, at least under the conditions that we assayed in this study (rad50S mutants), as we do not see the levels of DSBs continually increasing during the time course shown in Figure 1. We agree that cdc6-mn mutants are capable of completing homologous recombination, as evidenced by both recombination intermediates and full recombinant products that can be seen in this one-dimensional gel analysis. However, further analysis of repair pathways is far from straightforward because of the significant and asynchronous DNA replication in this strain (see Figure 6–figure supplement 1), which substantially complicates the analysis and interpretation of 2D gels. First, as is already obvious from the one-dimensional analysis shown in Figure 6, there are likely several different cell populations; some that repair with essentially wild type kinetics and others that fail to make dHJs. This heterogeneity makes more detailed conclusions difficult without extensive further analysis or additional cdc6 alleles. Second, the asynchronous replication intermediates also obscure major recombination intermediates (most notably single-end invasions), which essentially renders the analysis of these intermediates impossible in standard 2D-gel analysis. As this manuscript is primarily a characterization of the meiotic replication checkpoint, we feel that the in-depth analysis that would be necessary to further dissect DSB repair on partially replicated chromosomes is beyond the scope of this study. Therefore, in this manuscript, we state that there are problems in repair but refrain from making further claims about the types of repair that might be affected. Although we acknowledge the concern raised by this reviewer, we would like to stress (and now included a note) that all of the Southern and Western blots in this study were performed at least twice on independent experiments with highly reproducible results. Some of the experiments, e.g., DSB levels in mec1 and rad53 mutants, were carried out more than 10 times using independent strains and experiments, a subset of which are shown in this paper. For each Southern blot, we measured relative DSB levels (normalized to the level of DSBs in the wild type strain from the same experiment) for each time point in the time course, as shown in Figures 1 and 3. The quantifications are of the exact blots used in the paper. To address the lack of quantification of Western data, we now also included quantitative analysis of the Spo11 protein levels. All Spo11 Westerns include titrations of protein examined, to provide a more reliable estimate of relative protein abundance. We realize that our use of the term “hyperphosphorylation” was confusing in this context. We intended to refer to the extent of phospho-Dbf4 accumulation, e.g., the relative amounts of the protein that run in each band. Dbf4 migrates as multiple bands in all strains, representing varying levels of phosphorylation. When HU is added to wild type cells, more of the Dbf4 protein accumulates in the upper, hyperphosphorylated form than is observed in untreated cells. Although the band representing the hyperphosphorylated protein is still observed in mec1 and rad53 mutant cells, much less of the protein accumulates in this form. Therefore, the accumulation of such a large abundance of the total Dbf4 protein in this form is dependent on the checkpoint. We have reworded this section to clarify this point. 5) Figure 5A: the authors claim that the decreased levels of Spo11 observed in the presence of HU are restored in in mec1 and cdc6-mn mutants but this is not apparent in the gel that is shown. Quantitation and some loading controls would clarify this issue. We have now included quantitative Western and Northern analysis of Spo11 protein and RNA levels (new Figures 5 and Figure 5–figure supplement 1). We find that in HU-treated cells, SPO11 Transcript accumulation abruptly stops at the time of replication onset, ultimately resulting in a roughly 5-fold reduction of SPO11 RNA. From Western titrations, we estimate that this translates to a >10-fold decrease of Spo11 protein. Furthermore, the new quantifications confirm that this effect is indeed dependent on both Mec1 and Cdc6. As indicated in the answer to point 5, we have carried out Northern analysis of SPO11 RNA levels with and without HU to complement our protein analysis. We found that SPO11 transcript levels are also decreased, indicating that this regulation occurs at the level of transcription. Therefore, the regulation of Spo11 in budding yeast is distinct from that of Rec12 in fission yeast. We included quantification indicating that Spo11 protein levels are reduced at least 10-fold upon HU treatment (Figure 5), which likely reduces overall DSB activity. We also show genetically that reducing DSB level scan, in turn, significantly alleviate the replication block caused by DSBs; cdc6-mn cells containing hypomorphic alleles of SPO11 exhibited substantially rescued DNA replication as observed by FACS (Figure 6A) and CGH analysis (data not shown). Thus, although Spo11 is clearly not the only checkpoint target, its down-regulation is expected to have beneficial results for survival of meiotic cells with unreplicated DNA. However, we have reworded sections of the manuscript to better clarify that this is a working hypothesis. Because Rad53 can be activated by Tel1, we also analyzed mec1Δ tel1Δ mutants in this study (Figure 4–figure supplement 1), which looked similar to mec1Δ rad53Δ double mutants. Moreover, the epistasis analysis using the mec1Δ rad53Δ cells revealed that the decreased DSB levels in rad53Δ cells was not Mec1-dependent and the checkpoint bypass of mec1Δ cells was not Rad53-dependent. Therefore, we believe that these are two distinct phenomena, and that they belong in separate genetic pathways. We have now included quantification of the Southern blots in this figure to clarify the extent of DSB formation in mec1Δ cells. We also substituted a gel in which the +HU lanes are more equally loaded to compensate for the ∼2-fold reduction in DNA due to the lack of DNA replication in cells treated with HU. Figure 4 was intended to refer to the decrease in DSB formation that occurs in certain checkpoint mutants in the absence of checkpoint activation. Therefore, we showed only the quantitation for the untreated cells. We also quantified the HU-treated cells in each experiment, but including that data in the graph made it confusing because it was not relevant to the results being discussed in that section. Although we stated in the Results section text that we measured untreated cells, we have also added this to the figure legend to clarify this point. The quantifications in Figure 4A are of the blots shown in this paper (Figures 2, 3, Figure 2–figure supplement 1 and Figure 3–figure supplement 1, and Figure 4–figure supplement 1), and the method is now better described in the figure legend. We have shown that in HU-treated cells, Mec1 is responsible for reducing Spo11 transcript and protein levels, Mer2 phosphorylation and Rec114 and Mre11 DNA loading. All of these are novel observations from this study that we believe belong in the model figure. We marked the potential phosphorylation of Rec104 by Cdc7 with a ‘?’ to indicate that it was a hypothesis. We have removed this arrow completely, as this suggestion is not important to this study and we did not intend to imply that we have shown that Rec104 is a direct target of DDK, which would require mapping and mutating phosphorylation sites on the protein. We apologize for this confusion. The wrong version of this figure was uploaded. It has now been replaced by the proper version containing the data referred to in the text. In this paper we investigate the role of the meiotic replication checkpoint in preventing DSBs, which is what we refer to as a “checkpoint bypass.” For this reason, we show Southern data in what is now Figure 2–figure supplement 1C. We would like to emphasize that we used FACS analysis for every experiment to ensure that any significant DSB formation in HU-treated cells occurred in the absence of full DNA replication, thus separating the stalling of replication forks from the formation of DSBs on unreplicated chromosomes (as is seen for the mec1 checkpoint-deficient strains in Figures 3 and Figure 3–figure supplement 1). The control experiment comparing wild type and clb5Δ clb6Δ cells lacking prophase CDK activity was carried out and is included in the new Figure 2–figure supplement 1B. This antibody was also used in Sasanuma et al. 2008 with similar specificity. We agree that we cannot say to what extent the checkpoint-dependent regulation of DSB factors directly inhibits DSB formation. However, we know from the published literature that phosphorylation of Mer2 by DDK is essential for DSB formation, so we can predict that failure to phosphorylate Mer2 would have a significant impact on DSB formation. Similarly, we believe that down-regulating Spo11 significantly improves the DNA replication block experienced by cdc6-mn cells (see point 6 above). It is not currently clear in the field whether Mre11 and Rec114 must be on chromosomes to allow for DSB formation, however this is a likely prediction and prevailing model in the field (see Panizza et al., 2011). Therefore, it seems reasonable to hypothesize that all three methods of DSB factor regulation described in this study contribute significantly to preventing lethal DSB formation on partially replicated chromosomes. However, we have reworded the Abstract, Results, and Discussion sections of the paper to reflect the point that we cannot formally state that the observed regulation of DSB factors inhibits DSB formation. In fact, SC formation in cdc6-mn cells occurs relatively efficiently, and previous analysis actually failed to detect defective SC assembly in these cells (Brar et al. 2009). However, closer examination revealed that cdc6-mn cells exhibit an increase in the number of cells with regions of the nucleus without full SC assembly, which is what we counted. Image samples of a wild type cell with full SC and a cdc6-mn cell with partial SC and a polycomplex are shown in Figure 6–figure supplement 1D and the graph in Figure 6–figure supplement 1E is the result of counting 200 cells for each strain and time point. We have attempted to further clarify this point and we cite the work of Brar et al. (2009) at this point in the manuscript. We have now included the FACS profile for all of the strains in Figure 3, in addition to the FACS for mec1Δ cells that was already in Figure 3–figure supplement 1. These data indicate that there is no significant difference in genomic replication between mec1 and MEC1 cells. As mentioned above, we performed FACS analysis on all of the strains studied in this paper to ensure that DSBs in HU formed in the absence of increased DNA replication. To further address the question of whether increased DNA replication contributes to the DSBs formed in mec1Δ cells +HU, we also probed a late replicating chromosomal region that would not be expected to initiate replication even in mec1Δ cells, and saw the same checkpoint bypass as at the yCR047 locus shown in Figure 3. Thus, there is currently no evidence that the DSBs we observed in mec1Δ cells are due to increased DNA replication in these cells. This experiment is currently not included in the revised manuscript as it appears redundant with our PFGE analysis of mec1Δ cells +HU, which revealed that DSBs formed across the genome without significant DNA replication (Figure 3–figure supplement 1). We would like to thank Steve Bell for Mcm2-7 and Dbf4 antibodies; David Toczyski, Nancy Hollingsworth, Scott Keeney, John Petrini, and Michael Weinreich for plasmids; and Gerben Vader, Steve Bell, and Hannah Klein for comments on the manuscript. We especially thank Gerry Fink for generously providing lab space to HB and critical feedback on the project.